Nine changes to the starting eleven against Spurs and Newcastle eventually came through relatively unscathed, despite conceding early doors. The first twenty or so minutes had seen Newcastle mainly on the back foot and having twice floated the ball over James Tavernier’s head, the trick was repeated on 24 minutes and Epstein slotted the ball past Harper. Have to say yet again that I believe Tim Krul would have made a much better effort at saving it, with Harper rooted to the spot as their player turned it past him from wide of the goal. Truth be told he had little else to do over the course of the ninety minutes. Tonight was a chance for fringe players to show their worth and we had a mixed bag. The defence were steady enough although I have to say Tavernier looked a much better player going forward and like Santon last season needs to work on the defensive side. Most impressive were the midfield partnership of Bigirimana and Anita, combining well most of the time and stroking it around well. The Dutch midfielder slotting in impressively while Bigirimana looks to be full of confidence and ability. Predictably Cisse looked the part even though he was fed scraps, couple of clever bits of play almost seeing him in but the one real chance to come his way saw the keeper smother well. On the other hand Marveaux and Obertan out wide were desperate first half and while Obertan did pick up a bit late on, Marveaux was anonymous apart from one excellent diagonal run which ironically was his last contribution before making way for Jonas. Gosling was another who didn’t take his chance and for me flatters to deceive. Captain for the night, Mike Williamson, managed to somehow upset the whistle happy referee every time he went up for a set-piece but it was from one of these on stroke of half-time that Newcastle equalised. Having already played the minute of injury time, Ryan Taylor stepped up and hit another special 30 yarder free-kick, uncanny! Corners, long throws and free-kicks excellent, his general player unfortunately only squad level. Newcastle were on top for the second half and controlled possession without looking like winning it. 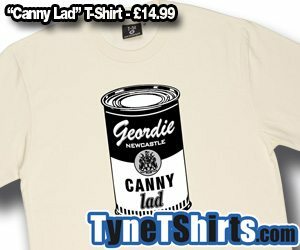 Obertan’s volley deflected just over, Cisse having one half chance and little else end product. 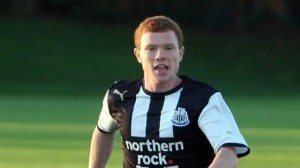 One player who will never forget tonight is Adam Campbell, making his first team debut and becoming the youngest ever Newcastle player in European action. The seventeen year old from North Shields looks to have a big future. Replacing Cisse with around fifteen minutes left he was buzzing around and as well as showing nice touches and linking up well with Amalfitano in one flowing move, Campbell was sent in down the right but from a very acute angle only found the keeper. We’re back in Europe and likely to progress on this evidence, the opposition looking an average team and Newcastle surely to finish this off at St.James’ Park.